A couple of craft beer lovers are behind another new restaurant, Southern Latitudes Brewpub & Grub, coming this month to a redeveloped end unit near the center of Bayfront that previously was not an eatery. Owner Tim Rogers and General Manager Mike Mettler are longtime friends teaming up to showcase their love for their southern Ohio roots and adopted Naples in a venue with about 75 seats inside and 50 outside at umbrella tables or under a covered walkway, plans show. 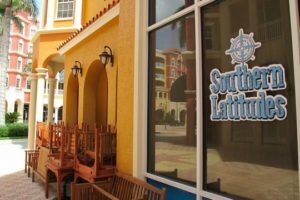 Southern Latitudes, promoted as “a warm, friendly place to gather,” will have about 70 Florida craft beers on tap, and wine on tap too. A brief, companion menu of pub food will offer appetizers, salads, sandwiches and flatbreads with a few nods to Cincinnati and the Deep South. Straight from Ohio, the venue’s Queen City chili dip will feature Cincinnati-style chili, cheddar cheese and cream cheese, with corn chips for dipping. A Cincinnati chili dog will start with a Guinness-infused hot dog covered in chili, cheese and onions with yellow mustard. “Between the Dough” entrees will include chicken and waffles, chicken and mango sliders, brisket sliders and barbacoa beef street tacos. Artisan flatbreads will feature varieties focused around prosciutto, grilled vegetables, Korean barbecue chicken, barbacoa beef barbecue, and bacon, caramelized onions and blue cheese. Bayfront offers waterfront living, shopping, and dining in Naples, Florida. Contact David to buy a condominium residence in this vibrant waterfront community. Pre-construction condos are available from $995,000 to $1,300,000 with living space from 2000+ sq ft to 2500+ sq ft. Existing condominium hoes at Bayfront are offered from mid $300K to low $700K. Bayfront is perfectly located in downtown Naples at Goodlette-Frank and 41 on the Gordon River. Bayfront offers many amenities and convenient access to marinas, downtown Naples shopping and dining, beaches, golf, and more.